The total for the year is $5,856.50. 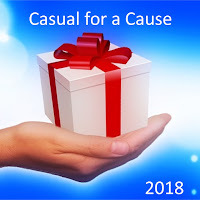 Casual for a Cause is an internal voluntary program at ACS where ACS employees can make a contribution to a designated charity for a particular week. No contractual relationship or any other affiliation exists between the designated charity and ACS. ACS employee contributions to, and acceptance by, the charity does not constitute any business relationship between ACS and the charity, or any endorsement of ACS by the charity.